Breweries by bike: a perfect match in Portland. But beer should be just the beginning. Cideries and distilleries have exploded in the inner Eastside industrial neighborhood where Cordilleran Tour makes its home! (Did you know Portland boasts the first cider pub in the U.S.?) Our guides, who have taken thousands of people on bike brew tours, wanted more; more variety, more great rides. On this one-of-a-kind tour, we’ll wind through the eastside streets, stopping to sample all of what the neighborhood has to offer, with short jaunts into pretty residential districts between stops. 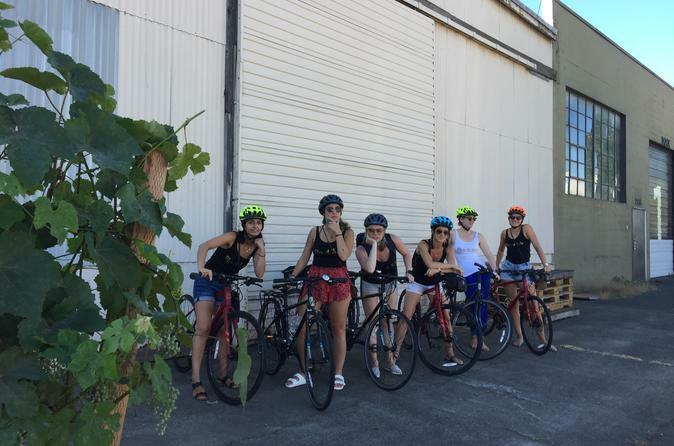 Tour price includes samples of beer and spirits, bike, helmet, and a guide intimately familiar with the city’s beer, liquor, cider and other treats to point you in ALL the right directions. Meet in inner SE Portland. 5-8 miles of easy riding. Bikes, helmets, beer, cider and spirits samples provided. Your tour begins at 3 p.m. at our bike shop in inner SE Portland, 811 SE Main: the heart of distillery row. But distilleries aren't all that thrive in the inner Eastside; breweries and cider houses now pepper the inner east side. (Coffee roasters, restaurants, chocolate shops, food carts, and plenty more also thrive nearby; there is truly something for everyone here!) Your guide will meet you at our shop and fit you for a bike and a helmet and get to know you. As the route can vary somewhat based on the group's needs, your guide will take some time to learn why it is YOU came to Portland before you head out. Once you are fitted, you and your group will wind through the pretty nearby neighborhood full of funky homes, hipster parks, and the artsy elementary school that served as Shining Star Preschool in Portlandia. Our first stop will be a ciderhouse famous for its funky style and birth in a Portland basement -- it now sells cider as far away as Japan. Wind through the inner NE neighborhood, past other unique Portland-grown specialties, and down the Willamette River back into the southeast into the heart of distillery row. House Spirits lives only a few blocks away from where Portlandia filmed its apocalypse episode, and what better place to spend the end of the world as we know it than a warehouse towering with whiskey barrels and distillery tanks? The company makes its own rum, aquavit, and coconut-husk-filtered vodka, as well as unique specialities like creme de cacao, and of course the signature whiskey. You will taste a few spirits while you are provided with a tour the facility, learning how modern-day Portlandians riff on Portland's wild bootlegging past. Get back on your bikes and ride to a nearby brewpub, where you will sample some of Portland's amazing IPAs and barrel-aged Belgian beers at Hair of the Dog; or world-famous sour beers at Cascade Brewing Barrel House; or one of the newer local favorites, like the beautifully designed Baerlic. You'll return to the shop by 7, near enough to a wide variety of restaurants, wineries, and more breweries and distilleries to stroll to dinner or a show afterward. Or you can hop on our Portland at Night Bike Tour and do Portland the way we do: by bike! Beer, cider and spirits samples are included, as well as bike and helmet and our professional guide.